Pathways Application Deadline Has Passed! Applicant Eligibility: Who Can Apply? We want to ensure the success of all the students in our program. So, we require that all prospective students meet the following requirements before applying. Financial Information: How Much Does Pathways Cost? Before reading this section, remember that acceptance to Pathways is NOT based on income. We are looking for talented students with good teacher recommendations. Your income level will not effect your acceptance to Pathways. A Pathways Scholarship covers private lessons, and any classes or ensembles you are eligible for. All students are required to pay a $30.00 registration fee per year. There may be other fees (up to $25/semester) for materials such as theory text books, or music books. Need-based funding for materials is sometimes available upon request. Application and Audition: How Do I Apply? Ask your school music teacher to submit a recommendation. Fill out the Pathways Application Form online. RCSD Music Teacher Recommendation Form This form must be filled out and submitted by your RCSD teacher. We cannot process your application until we have this recommendation. Elementary Choral Students Perform any traditional song such as: My Country Tis of Thee, My Favorite Things or Edelweiss. The Eastman Pathways Program, a partnership between the Eastman School of Music and the Rochester City School District (RCSD), provides RCSD students in 4-12th grades with generous scholarships to pursue music studies at the Eastman Community Music School. Each year, Pathways is home to almost 70 of Rochester’s top student musicians. Students begin with private lessons, and can advance through theory and music history classes, participate in ensembles and some choose earn an ECMS Diploma. Eastman Pathways honors the legacy of world-renowned baritone William Warfield, who graduated from both the RCSD and the Eastman School of Music. 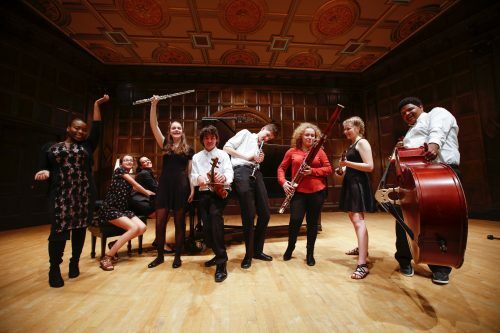 Graduates of the Pathways program have attended colleges such as Eastman, University of Rochester, Harvard, MIT, Columbia, the University of Miami, SUNY Fredonia, the Manhattan School of Music, and Juilliard. Since the program’s birth in 1997, its student population has always reflected Rochester’s rich, cultural diversity: underrepresented minorities account for over half of the graduating classes. SEPTEMBER 8 Welcome Back Party! FEBRUARY 18 – 24 Winter break! These events are FREE and open to all current Pathways students! A welcome and orientation event for all Pathways parents and students. Lunch and lots of fun provided! Invitation and RSVP sent via email. Come celebrate the holidays with your Pathways classmates! Our team is currently planning some new games and fun for the evening, so we hope you can join us! Attend a special Gala event with your Pathways classmates. Includes an RPO ticket, VIP pre-concert talk, cookies, visits from the conductor and musicians…and more! FREE for all Pathways students! A celebration for all Pathways graduates. You and some family members are invited to dinner and an awards ceremony. Throughout the year, we offer info sessions for Pathways students who are applying to college, or have questions about careers in the music field. Eastman School of Music faculty often join us and are available for questions. Stay tuned for dates and topics! Please contact Hannah with any questions regarding Pathways!